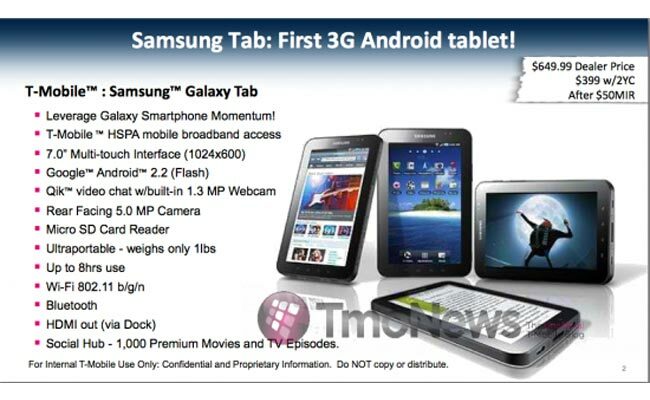 The guys over at TMO News have managed to get their hands on some pricing information for the Samsung Galaxy Tab on the T-Mobile network. The Galaxy tab will retail for $399.99 on a two year contract after a $50 mail in rebate, and it looks like they will also be selling it without the contract for a retail price of $649.99, and this ties in with the pricing we saw for Sprint last week. The Samsung Galaxy Tab features a 7 inch touchscreen WSVGA display and it comes with Android 2.2 Froyo, there is also a 3 megapixel camera on the back for taking photos, and a VGA video camera on the front for making video calls. The Galaxy Tab will feature a number of built in Google services, which includes Google Navigation, Google Goggles and Google Places, it also feature built in GPS. There are no details as yet on when the Galaxy Tab will be available with T-Mobile.